What a festive way to wish someone a "Happily Ever After"! Shake the water globe to shower Mickey and Minnie with confetti. The hand-painted base features a pastel quilt pattern and "Happily Ever After" plaque. 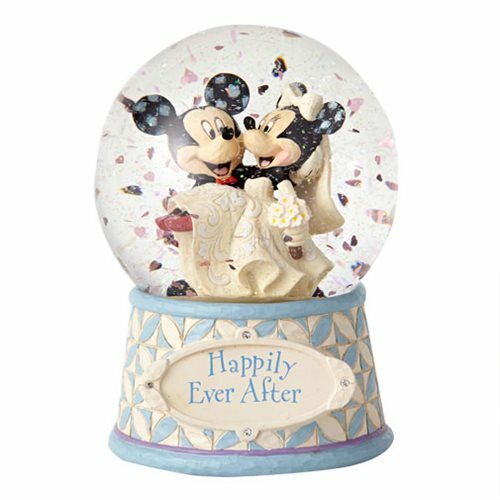 We can't think of more festive way to wish someone a "Happily Ever After" than this wonderful Disney Traditions Mickey and Minnie Mouse 6 1/2-Inch Water Globe. It lets you sneak a peek at Mickey and Minnie's dream wedding, and you can give it a shake to shower the happy couple with colorful confetti. The hand-painted base features a pastel quilt pattern and "Happily Ever After" plaque. Made of stone resin and glass, it measures about 6 1/2-inches tall x 5-inches in diameter. Congratulations!